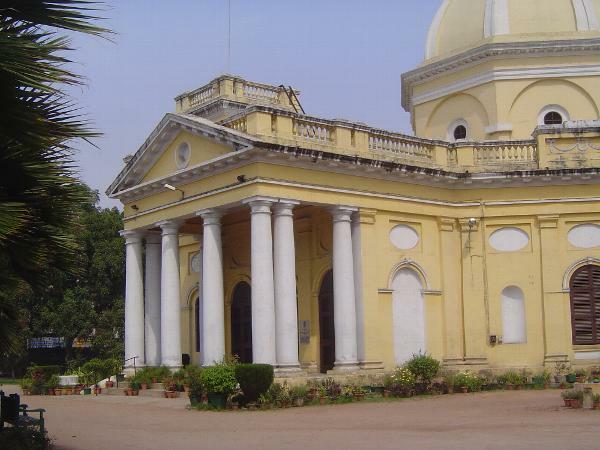 The oldest surviving Christian church in Delhi is St. James, paid for by James Skinner, a soldier who had vowed to build a church if he survived the wounds he had just suffered in battle. 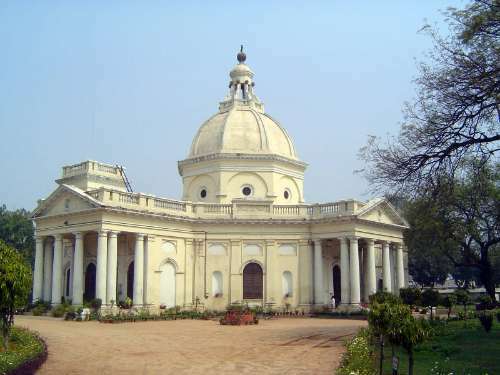 It was completed in 1836 on an unusual cruciform plan and, though damaged, survived the rebellion of 1857. Here it is as it was in 1980. Notice that ladder up top on the left? Twenty-five years: it's 2005, and the ladder hasn't moved. Shades of Jerusalem's Church of the Holy Sepulcher. The good news is that the sky's a bit bluer. Fast forward to 2014, and the ladder's still there. Conclusion? There's probably a water tank up there. Anyway, here's the official version of the church's founding. 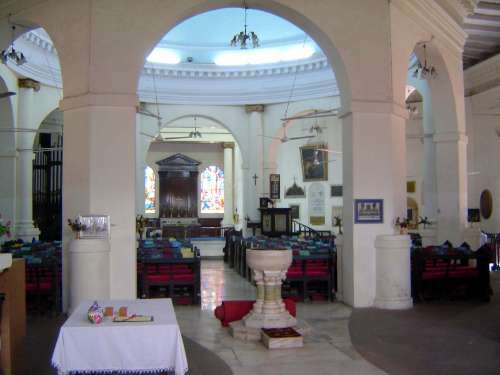 The interior is dominated by the piers supporting the dome. 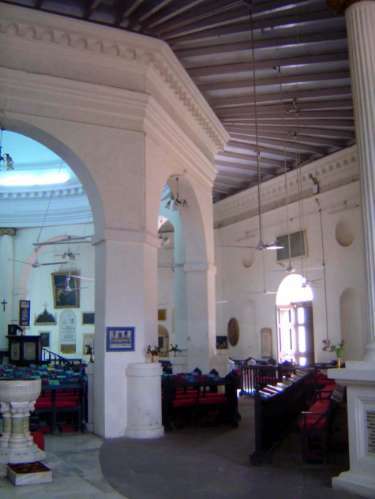 An octagonal aisle surrounds the piers. Amazing that any orphans were left. 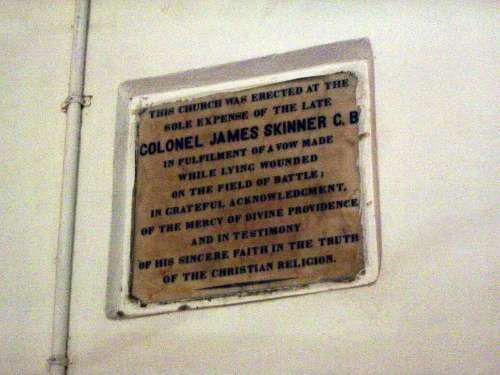 Outside the church, there's a fenced cemetery for the Skinner family, though Col. Skinner himself is buried in the church. 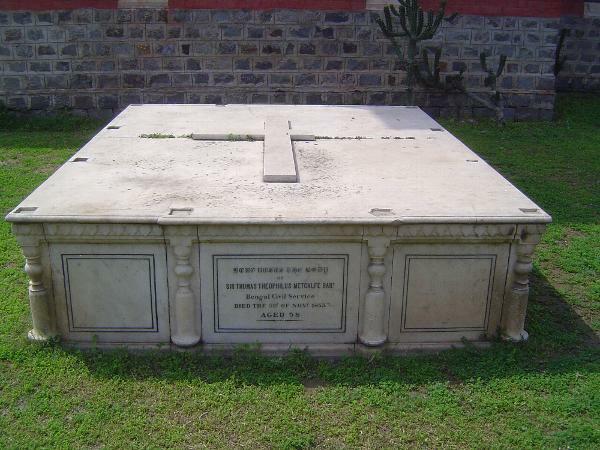 On the other side of the church is this isolated tomb. 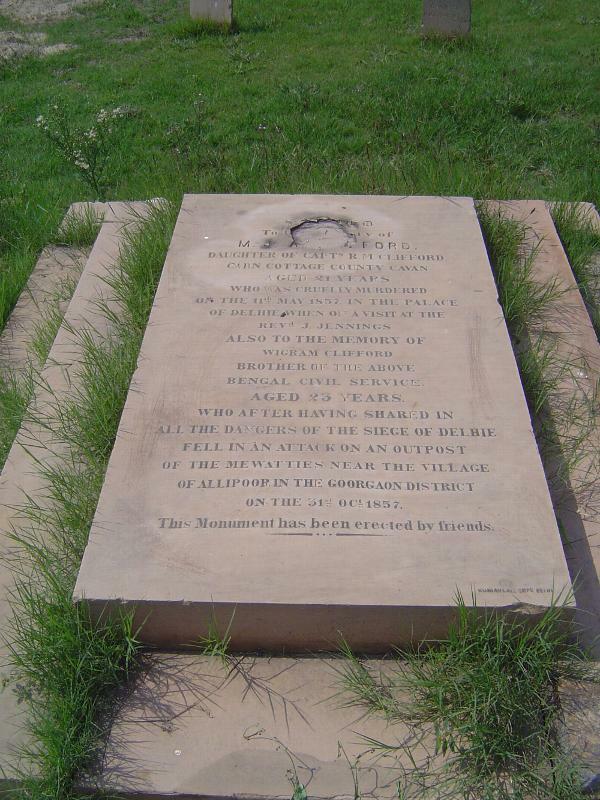 Metcalfe had been the East India Company's ambassador to the court of the last Mughal emperor. 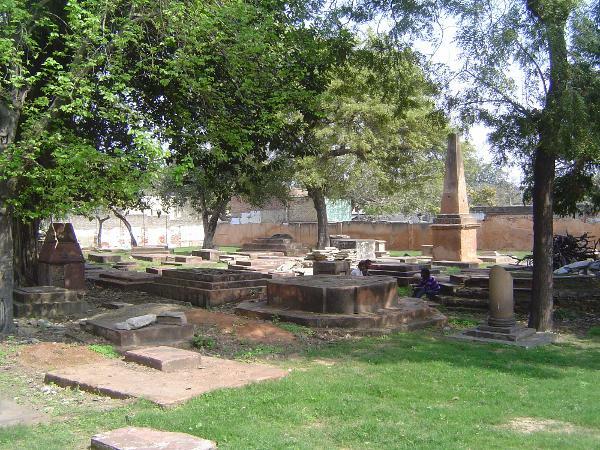 He had sufficiently annoyed one of the Mughal's wives that she had him fatally poisoned. A couple of blocks to the south, the Lothian Road Cemetery is nearly in ruins. 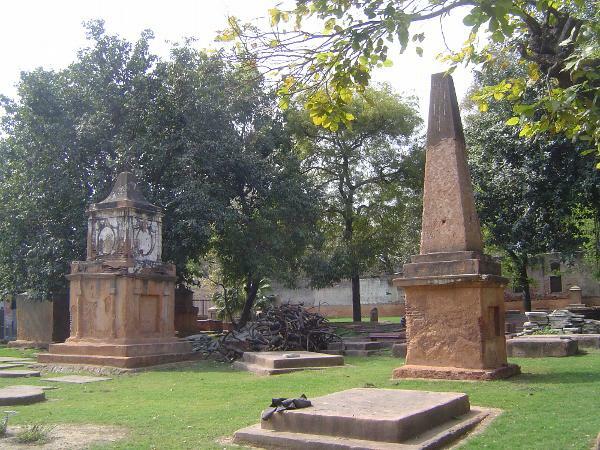 Its graves date from 1808 to 1867 and include many victims of 1857. 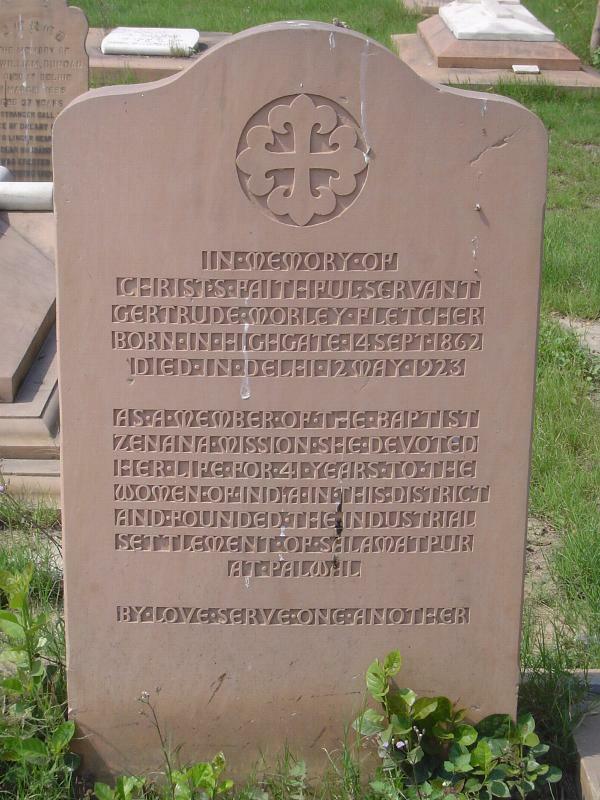 Most of the stones are illegible. On another subject, do you wonder about that pile of branches? 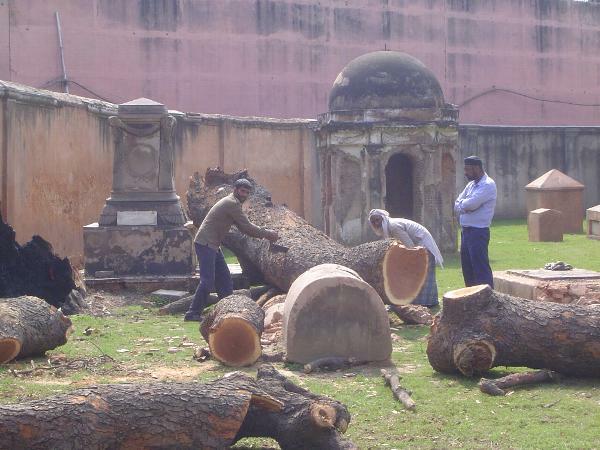 Wonder no more: the two men are removing what appears to be an old, old mango. Let's hope it was dead. 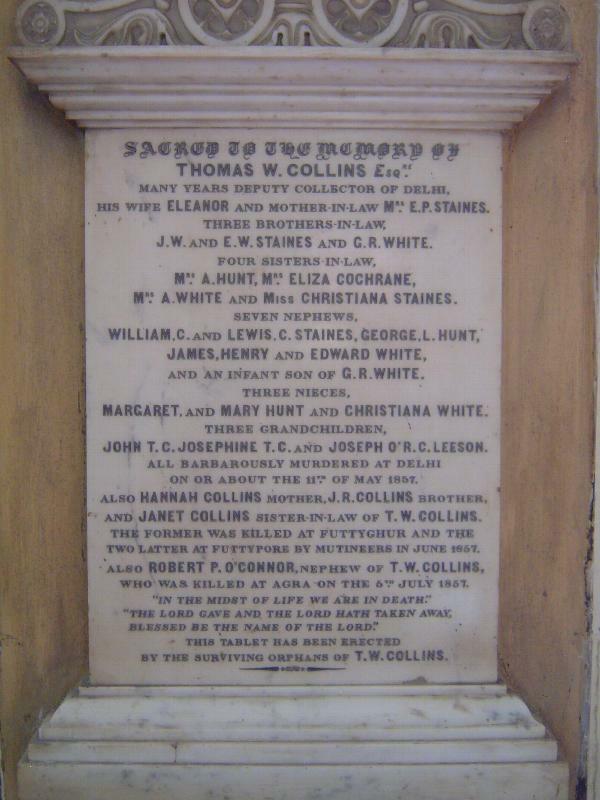 The domed tomb may well be that of Thomas Dunnes. If so, it was paid for by his friend, none other than Col. Skinner. And yet a third cemetery, much bigger than the previous two. 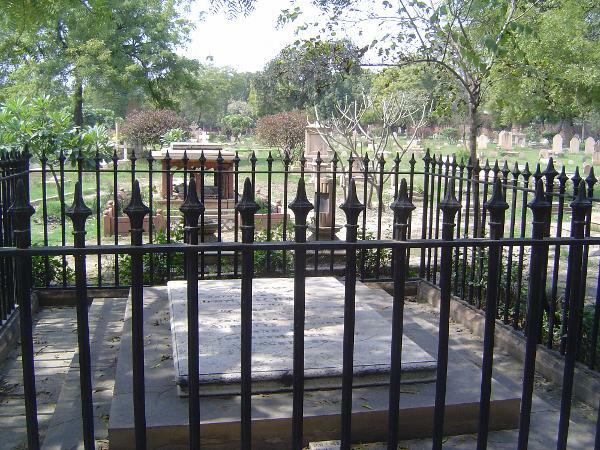 We're at the Kashmir Gate Cemetery, popularly called the Nicholson Cemetery, about a 10-minute walk north of St. James. 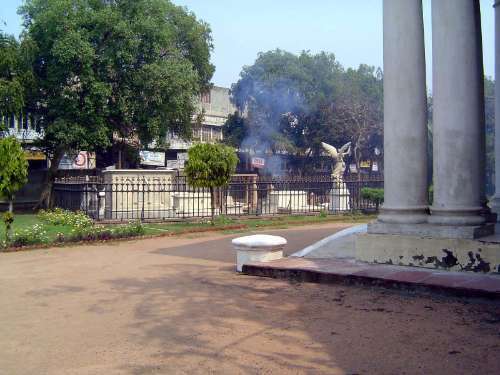 A wider view of the same cemetery, with an iron fence around its most famous occupant. 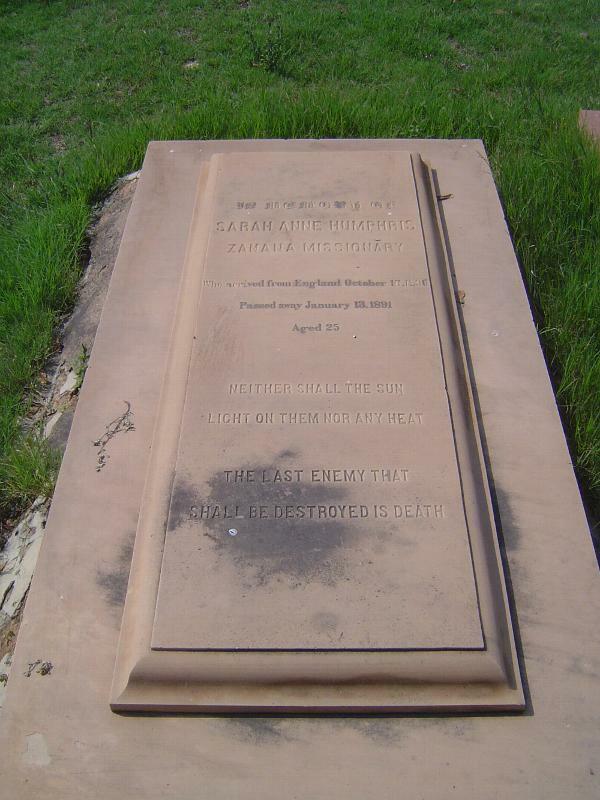 General John Nicholson, "who led the assault on Delhi but fell in the hour of victory, mortally wounded, and died... aged 35." 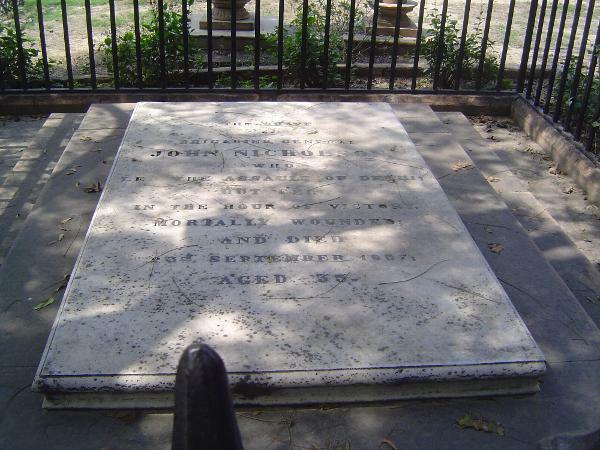 The Nicholson Cemetery remained opened for many years after 1857. 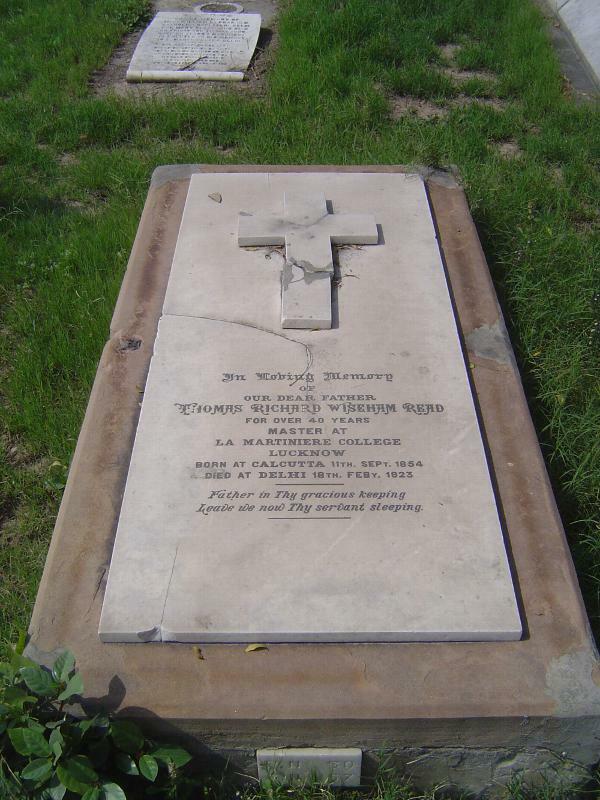 Here's the grave of a school teacher from a famous institution in Lucknow. 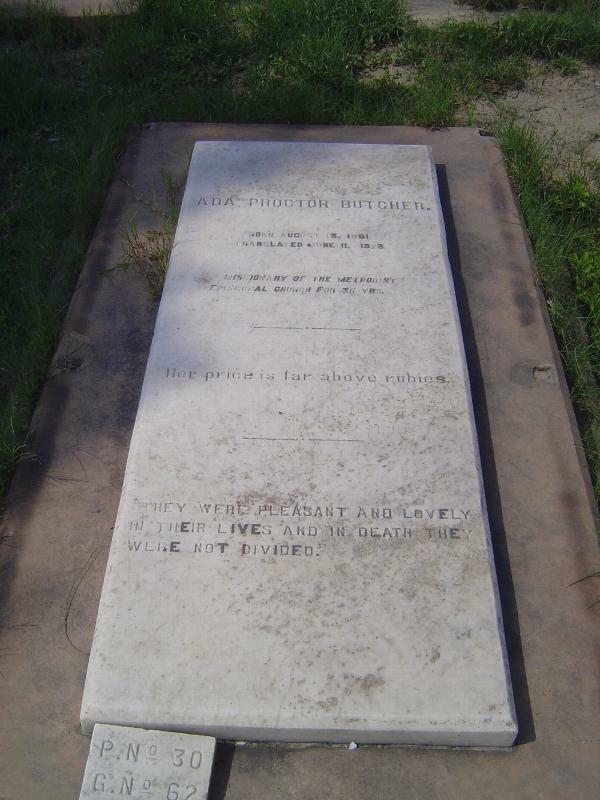 And here's John Butcher, who was in charge of Methodist missionary programs in North India and who was responsible for creating the Lucie Harrison Girls' High School in Raiwind, near Lahore. As of 2014, it was still going strong. 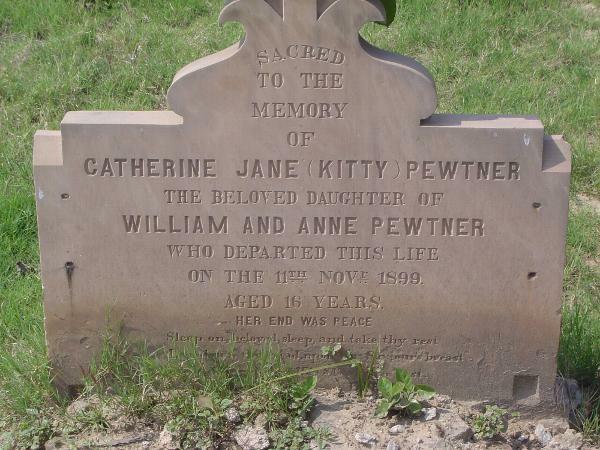 His wife, who was "translated" a day before her husband. 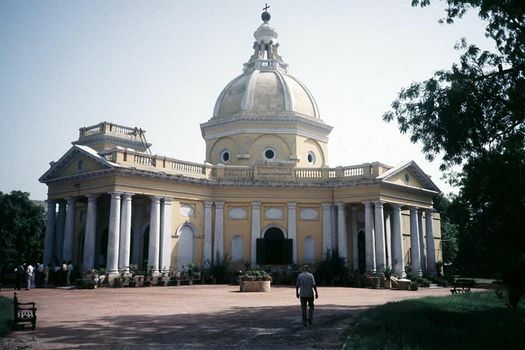 Miss Fletcher served over 40 years at Palwal, which is on the Agra road and about 35 miles south of Delhi. 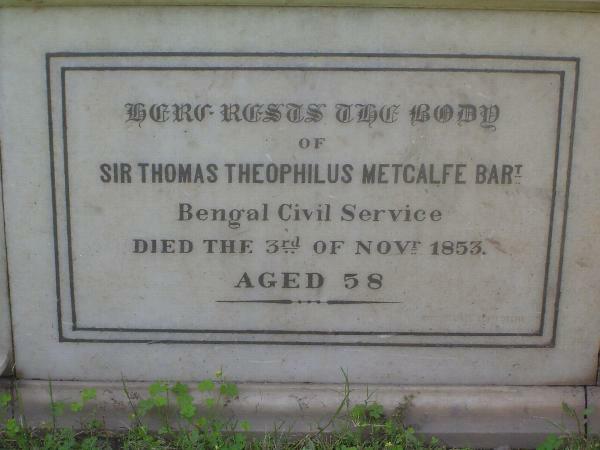 A missionary who arrived in October, 1890, and died the following January, aged 25. And you thought 25 was young. 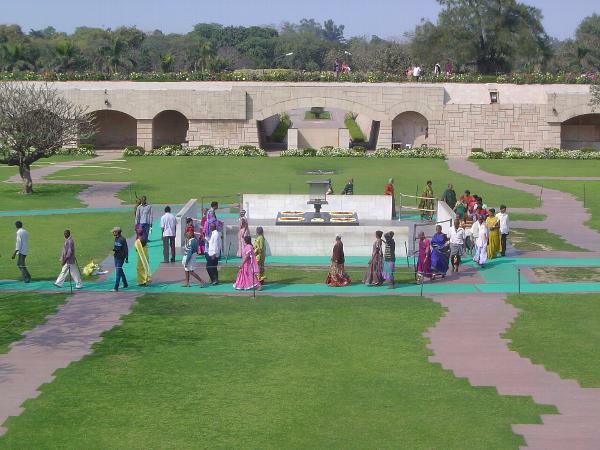 Along with the Taj Mahal, this is the most visited of all India's funerary monuments. 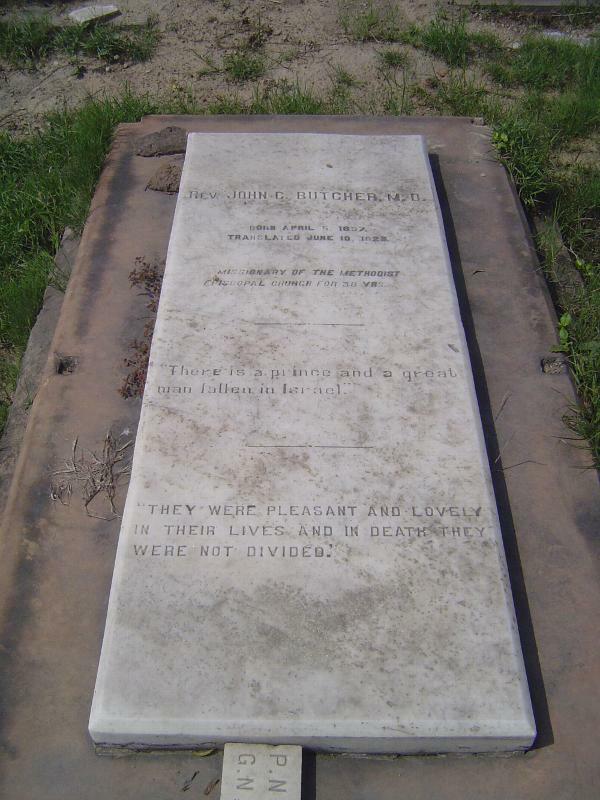 It's about three miles to the south of the Nicholson Cemetery. 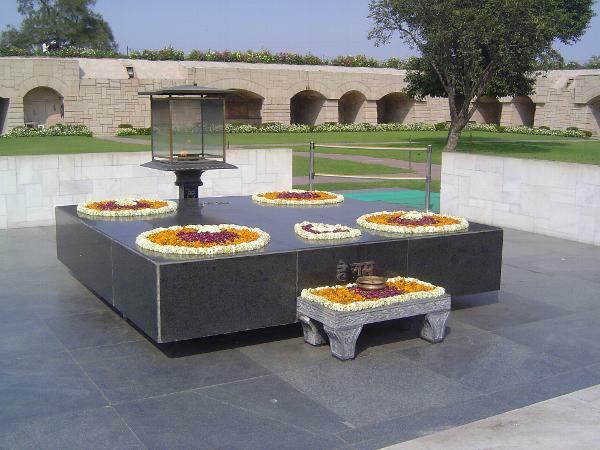 It marks the spot of Gandhi's cremation.